The Croatian Embassy has confirmed the arrest of a large group of fans of Croatia's football team Dinamo Zagreb in downtown Sofia in the late afternoon Thursday. The Croatian ultras are representatives of a group that is in bitter conflict with the management of the Croatian Football Club which barred them from attending its games because of serious disorderly conduct, vandalism and violence, reports the Bulgarian bTV. The young people have used the visit of Dinamo Zagreb in the Bulgarian capital to attend the team's Europa League match with Bulgaria's 'Ludogorets. They have bought tickets in Sofia for the Bulgarian sector of the field, which was seen as readiness for provocations. 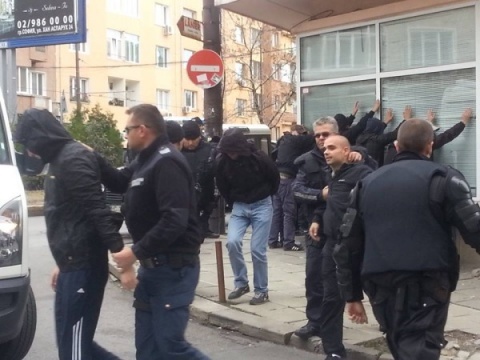 The Croatian Embassy has confirmed that 22 of them have been arrested after a call was placed Thursday on the emergency 112 hotline informing of a huge fight in downtown Sofia. Police patrols responded immediately, but Croats resisted arrest and ran away. This necessitated the intervention of Sofia riot police. The detained were taken in a police van to the Metropolitan Police Directorate. According to bTV, the total arrests were 45 – 22 were detained for football hooliganism, 21 for disobeying police orders and 2 for theft. Meanwhile, another 40-50 fans were warned that they will not be allowed inside the stadium and they left back for Croatia. A total of 70 Croatian fans of Dinamo Zagreb arrived in Sofia for the game. Local media report that none of the Croatian ultras managed to attend the game. Dinamo Zagreb is known for his radical fans who often pose problems for police. They are part of the fraction Bad Blue Boys seen as some of the most dangerous ultras in Europe. It was established in March 1986, their mascot is a bulldog, and their anthem is "I Love Dinamo!" Meanwhile, later in the evening, the Bulgarian champions Ludogorets Razgrad earned their second straight win in this year's Europa League after beating Dinamo Zagreb 3:0. No vandalism or violence was reported after the match.